Just add wood and slide to the Kodiak play set hardware kit and build the perfect custom play set! hardware only kit includes hardware, swings, and tarp. Just add wood, slide, and wood screws (not included) to complete your play set. Doing it yourself has never been this easy! 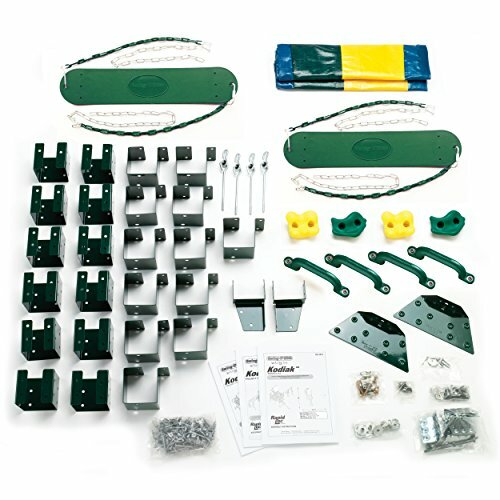 the Kodiak custom ready-to-build kit features the revolutionary Swing-N-Slide bracket system to help ease build time! kit includes 4 climbing rock holds with hardware, Multicolor tarp, 4 swing hangers, 2 swing seats, 4 safety handles, and fully illustrated plans with different build options to choose from.